The Paddle Palace S4W Pro Robot takes robot technology to the next level. Two heads and four throw wheels and advanced technology provides outstanding options for practice sequences, and the best human-like robot play. The S4W Pro is a solidly built, reliable machine completely supported by Paddle Palace’s 30-day money-back guarantee and one year limited warranty. Click Here to see Owner's Manual. 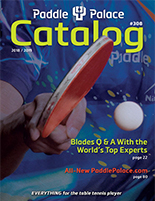 Yes, all the Paddle Palace Robots can be used with the new 40+ Balls. Does this machine support 40+plastic ball? Yes, the four heads of this robot control the ball speed and spin independently. You can set different degrees of rotation for each wheel. This means you have great control over the amount of spin that you receive. Can the heads of this robot control the ball speed and spin indipendently? This is important to produce different loop and different backspin balls. CAN THE HEIGHT OF THROWING WHEELS BE ADJUSTED UP AND DOWN ? The answer to the question below is YES. This robot has two heads and 4 throw wheels and the height of the two robot heads can be adjusted. With two heads you can set it for two different heights, allowing for many options for your training sequence. For example, one head can be set low for serves and the other one set at medium height for drives and chops. Another options is you could set one for very high balls and the other for normal-height balls. Imagine a training sequence where you hit a few counter-drives from various points you set on the table, then finish off with a few lobs. This is a great advantage to having 2 heads with 4 throw wheels! Granted this is my first robot but it works really well. It makes it easy to practice any shot and the ability to go from various spins makes it great. The one downside I have is when that the ball will go through the portion of the net that is open where the balls are launched.